Before moving to Kendal, Sue and Joe Colucci lived in a rustic cottage in Michigan, and the décor was unsuited for fragile, elegant art work. But one day at an art show, the couple was drawn to a glass sculpture bowl, both fragile and elegant. “And affordable,” Sue says. Still, they resisted the purchase. Later, Joe returned and bought it for Sue as a Christmas present. “We found a safe place for it on the lower shelf of a glass-topped coffee table,” Sue says. Colucci’s glass bowl is one of more than 80 items currently on display in “Kendal Collects,” a biennial exhibit in the community’s three galleries. The original artwork includes paintings, photographs, wood carvings, pottery, weavings and more, all collected and owned by Kendal residents. What else can you see as part of “Kendal Collects”? “I am really impressed with the art here,” says Sue, referring to both shows. Sue also contributed a woven wall hanging of a butterfly, purchased during a trip to Ecuador. “After our children left for college, I became a travel agent and finally got the chance to investigate many of the locations that I had always dreamed of seeing,” she explains. When the couple moved to Kendal two years ago, she figured her days of buying artwork were over. But not so. “I’m always moving things around to get more space,” she says. Other residents have moved things around to display their purchase of a watercolor by resident Sheila Eckstein, whose retrospective exhibit just concluded at Kendal. Sheila also contributed a piece for “Kendal Collects” – “View from the Studio” woodcut by Sidney Hurwitz. For instance, John Leinenweber is the author of several spiritual books. 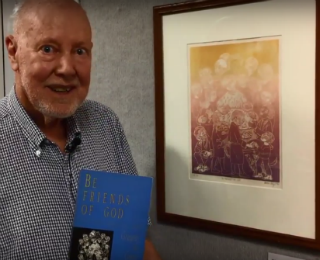 John submitted a print by Austrian-born Helen Siegl, who created the work for the cover of John’s Be Friends of God. John and Helen met through Mount Saviour Monastery in upstate New York, a religious community of the Benedictine order where John was a monk and Helen frequently visited. Later, John moved to the Monastery of Christ in the Desert in Abiquiu, New Mexico, and then a hermitage in Connecticut. What brought John to Kendal three years ago? “The New Yorker,” he says, referring to a small Kendal ad that frequently appears in the weekly magazine. One of the most well-known artists in “Kendal Collects” is British sculptor Henry Moore. Mary Lee Orr spent her junior year in London and became friends with a man later involved with the estate of Moore, who died in 1986. In addition to sculptures, Moore also created tapestries, textiles and drawings, and Mary Lee was able to purchase the “Family Group 1984” lithograph. “I was overjoyed,” says Mary Lee, who moved to Kendal late last year.